Canton Village Quilt Works | What Cha' Working On??? Yesterday was a great day! It was the first "official" day in my new studio. To get students familiar with it I am hosting a few sew in days before normal classes get started. So they are just bringing projects that they are working on and trying to finish them up. It was a lot of fun to sit and sew with everyone and get something accomplished. I took a few photos throughout the day showing what they were working on... great inspiration! Donna brought along this great little pincushion, so I had to take a photo... isn't it cute?? Remember the sign that my son made me for Christmas? I brought it with me and displayed it proudly in the window. Donna and Leslie happily working away. The hubs and I put together this Ikea cabinet as a cutting/storage table and it got used quite a bit today. Nancy and Kris working on some fun projects. They will both be in my Cactus Flower Table Runner Class in a few weeks. Roberta is quite contented at her machine. Nancy brought along this pickle dish quilt to work on, but I think she never got to it yesterday. Roberta finished quilting and applied the binding to this quilt that will be going to the local hospital dialysis center. Great job, it will be loved! Nancy shared this pineapple quilt... very pretty! She also had this pretty swirly table topper. Nancy was working on this flannel quilt. This will be a nice and snuggly quilt when it is complete. Donna was working on my design... Fresh Palette. I just love this quilt. You can see it here. 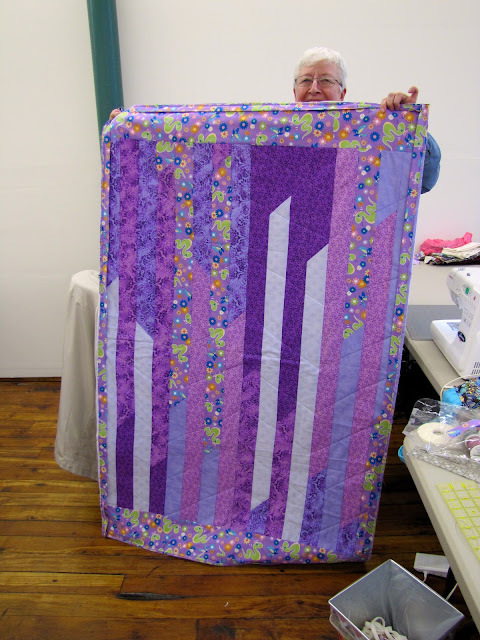 Roberta had one last project, she was working on this scrappy chevron quilt. A great way to use scraps.